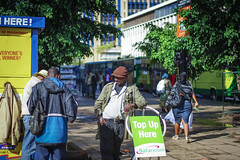 In February this year the government announced a 10 percent tax on all financial transactions in the country, including cash transfers through the widely popular and highly utilized mobile cash service such as Safaricom’s M-Pesa, which is commonly used by people who do not have access to traditional banking facilities. Bob Collymore stated that Safaricom is already absorbing some of the costs of the tax, but any further increases to taxes for such transfers would need to be passed down fully to the consumers. Any hikes to the taxes on electronic transfers would effectively become an extra tax on spending money,as such facilities are often used to pay salaries, bills, or to make everyday purchases, and transfer funds between individuals. Increasing the tax will have an especially detrimental effect on individuals in poorer or rural areas, which often have a higher uptake of mobile funds transfers services, commonly being used to receive funds from family members working in cities and other unbars areas. Kenya has a number of similar electronic transfer services, such as Orange Money, Airtel Money, and YuCash, which are all subject to the same tax.